Things have been changing in the living room. I keep meaning to post a picture, but the reality of life with animals is that it never really looks that great in there. But, in the interest of disclosure and—as promised—of showing more complete images of the house, here’s how it looks right now. 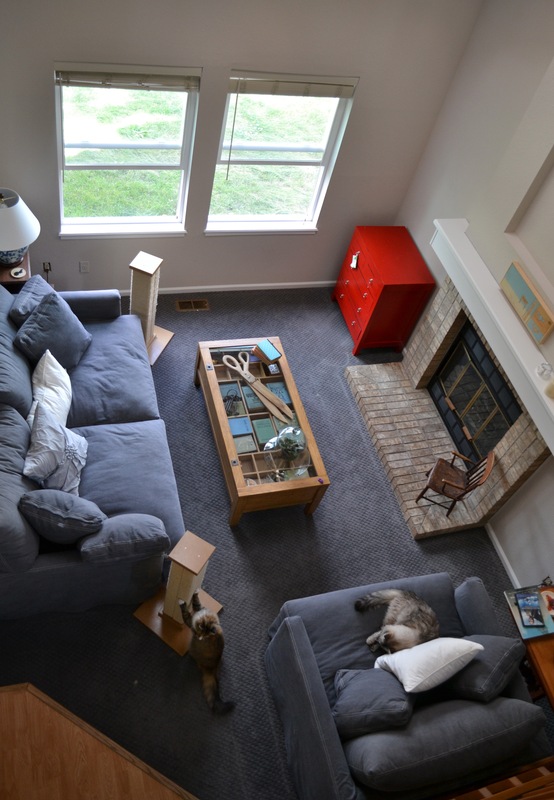 The layout: behind the larger couch is a half wall; the chair-and-a-half is in front of the stairwell. The windows look out onto the backyard. The living room is sunken down a step from the level of the hall, kitchen, and dining area (on the other side of the stairwell). The kitchen sink is on the other side of the half wall, but, because of the elevation you can’t see it from the living room. I’m standing at the top of the stairs–outside our bedroom–looking down. Yes, the price tag is still hanging off of that red chest in the corner. It’s the perfect size, but the color kind of makes my head hurt. I’m thinking about repainting it (shh, don’t tell Ricky). I hate those blinds. None of the electrical outlets have covers. The stuff on the mantle is still pretty much a random assortment of things that I took out of boxes. Yes, those are scratching posts. Yes, Meowice is demonstrating the necessity of multiple scratching posts. The little wooden chair by the fireplace has a family legacy: my great-grandmother, yearning for grandchildren, apparently used to bring it out and quietly set it in the room when my newly-married grandparents were visiting. My mother brought it out of the garage and put it there while she was visiting. In all the drama of moving out, moving in, painting, having popcorn ceilings scraped, and waiting for our carpet, we ordered some new furniture. In the last house, I had two couches: one, white slipcovered Pottery Barn sofa and two, nearly identical Ikea copy of that sofa. The Ikea sofa did not make the trek out west (wouldn’t fit in the covered wagon) and we have two living spaces here that needed couches: this main level room and the large rec room downstairs, where the tv lives. For the first week or so after our carpet finally arrived, this space looked pretty much the same as the living room in the old house: same white chair, white sofa, and coffee table. The new furniture was supposed to go downstairs. And, of course, it wouldn’t fit down the stairwell. With some shoving, the old white couch (somewhat complainingly) did fit. So, we had to switch the furniture plans. I had been on board all along with the idea of having big comfy furniture downstairs with the tv, but at first, I wasn’t wild about having these monsters upstairs. I like my daintily scaled, white furniture. But it is ridiculously impractical sometimes. My favorite example: for two years I had to change my pants the minute I walked in the door because my favorite pair of jeans (RIP) always rubbed indigo dye all over the white couch. To say nothing of the pets. Oh, the pets. These are much more practical. They are also a bit of a departure from my practiced aesthetic. I’m working on trying to make the room feel a little more like me. And the new furniture is so much better for lounging. I keep trying different combinations of throw pillows. You know, besides the cat-shaped one.